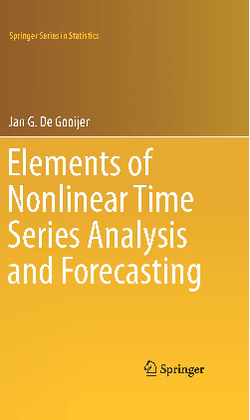 This book provides an overview of the current state-of-the-art of nonlinear time series analysis, richly illustrated with examples, pseudocode algorithms and real-world application. Avoiding a "theorem-proof" format, it shows concrete applications on a variety of empirical time series. The book can be used in graduate courses in nonlinear time series analysis and at the same time also includes interesting material for more advanced readers. though it is largely self-contained, readers require an understanding of basic linear time series concepts, Markov chains and Monte Carlo simulation methods. The book covers time-domain and frequency-domain methods for the analysis of both univariate and multivariate (vector) time series. It makes a clear distinction between parametric models on the one hand, and semi- and nonparametric models/methods on the other. This offers the reader the option of concentrating exclusively on one of these nonlinear time series analysis methods. To make the book as user friendly as possible, major supporting concepts and specialized tables are appended at the end of a chapter. In addition, each chapter concludes with a set of key terms and concepts, as well as a summary of the main findings. Lastly, the book offers numerous theoretical and empirical exercises, with answers provided by the author in an extensive solutions manual. 1st ed. 2017, XXI, 618 p. 94 illus. in color. The Solutions Manual (PDF format, 200 pages) containing codes and answers to all exercises is available to instructors upon request. Please send your request to Springer via e-mail.